EPMS: I've been listening to your music a lot lately, and one particular song is getting stuck in my head, 99 bottles, which is loosely based on that song you sing in the car as a kid, 99 Bottles of Beer on the Wall.... In your version, you name a few dozen brands of beer. Does that stand out to other people or is it just me? Zane Williams: Definitely one of my more popular tunes. It's a very fun part of our life. I usually hop off the stage and go into the crowd, drink a beer with people, and have them sing along with me on the microphone. That song is an excuse for everybody to just have a good time. That's definitely a crowd favorite. It was never a radio hit for me, but someday, when I do a live album, I'd like to maybe release a live version of that song, because it has such great energy live. EPMS: You recently had your equipment stolen outside a Houston restaurant, and you had to put on a show in Galveston that same night. I was reading that a bunch of your fans and friends donated equipment for you with which to play that show. Was it weird, playing with other people's equipment? Zane Williams: Well, we actually got a lot of our equipment back that day, because I had a GPS tracker in the trailer. So, the police were able to recover the trailer forty-five minutes after it was stolen. The thieves got away with our van... Our van didn't have a tracker, and by the time we found the trailer, they had unhooked the trailer and driven off with our van. So, what some of the fans did, was give us a line to where the trailer was, and it was actually a Houston police officer that was familiar with my music who came over there and gave us a pickup truck for the night, and we used the pickup truck to pull the trailer to the gig, and then some other fans took the rest of the band to the gig. Our stuff was stolen at 1 pm, and we were literally on-stage singing at 5 pm in Galveston. but during that time we had to have some fans come get us at the restaurant, take us to the venue, and take me to where the trailer was, hook up to the trailer and haul it to the gig. So, we ended up having all of our gear except for my electric guitar player, his guitar and his amp had been in the van and so he ended up having to borrow Kevin Fowler's guitar player - Paul Eason is his name - he borrowed Paul's guitar. He was having to play borrowed equipment. The rest of us played on our own stuff. It's kind of a miracle that we were able to get it all back. I literally, finally, in a borrowed pickup truck with the stolen recovered trailer hooked up to it, I got there about 4:55 and we went onstage at 5. EPMS: You lost a one-hundred year-old fiddle? Zane Williams: Yeah, that was the worst thing we lost. My fiddle player has an acoustic fiddle, a violin made out of wood, then he has an electric fiddle and his electric fiddle is what he generally plays, because it's less fragile and so he had his electric fiddle in the trailer. So, we got that back, but unfortunately his acoustic fiddle was in the van. We have not see that since. We did get the van back two weeks later. We found it abandoned with all our valuables gone. So we haven't seen the guitar, the fiddle, laptops, any of our other valuables gone. The fiddle was the most irreplaceable of all those things. EPMS: How do you divide your touring time between Texas and out-of-state shows? Zane Williams: Oh, I'd say it's eighty percent Texas and Oklahoma right now. We would like to spread out some day, but right now you know there's so much Texas and Oklahoma that we still haven't conquered. Just this past weekend, I played in Texarkana and Port Aransas, and I had never played in either of those towns before. We had some fans there, but a lot of the people there didn't know who we were. So, there are so many places within a four or five-hundred mile radius of Dallas where we've never played, and people haven't heard of us yet, that it's really my focus to try to conquer that four-hundred mile radius where travel expenses are less, and it's easier to get home to my family and stuff. We've done a couple of things in Europe, and I've done a couple of things in Mexico the last couple summers you know, special trips like that are fun. If you're able to make it big, close in Texas, you're gonna have fans all over the country to a certain extent, just because of word of mouth, the internet, and displaced Texans, you know that live all over the country, but for now, it's so expensive to go all the way up to Chicago, say, or Minneapolis or California or something. We're still just a young band, trying to get going, and it's just easier to stay within that four-hundred mile radius. EPMS: Your Mexico trip was advertised as a package for Dallas/Fort Worth-area fans of yourself and a few other Texas country artists. How did that go? Zane Williams: This year, it was to Cancun for a week, and I went with Wade Bowen, and Sean McConnell, Stoney LaRue and Randy Brown. So, there were four other singer-songwriters, and we all just brought our guitars down there to Mexico. It was pretty much a week of hanging out by the pool each afternoon. It would be a guest and me, playing by the pool for a couple of hours. Every evening there was sort of a song swap, acoustic concert between two or three or four of the artists that were down there. It was pretty much a laid-back Mexico trip at an all-inclusive resort with acoustic song-swap type shows every afternoon and evening. EPMS: What kind of reaction did you get? Zane Williams: Oh, they love it. They're kind of easy pickins, I guess. Obviously they're music fans, and they're there to have a good time. I was excited about that trip just because I have a lot of respect for the other artists that were going on it. I'm a fan of all those guys' music a lot, so that made it fun, too. It was song swaps with artists whose music I really like. I think once again, a lot of that crowd was from the Fort Worth area. Not all, but the folks mostly lived in the Fort Worth area, and we get a lot of radio play in the Fort Worth area. We know a lot of people, but there were still a lot of people on that trip that had not heard me before. They were getting introduced to my music for the first time. I think we made a lot of fans, and a lot of personal connections. I'm already seeing several of the Cancun people out at my shows since then. EPMS: People who had traveled there? 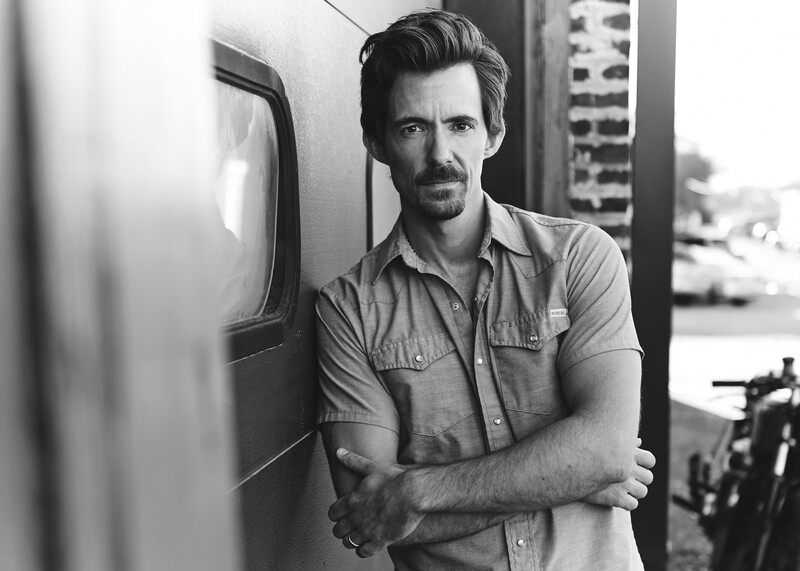 Zane Williams: Well, I don't get to spend as much time with other artists as I would like, because we're all sort of criss-crossing each other. I wish I could see some of these guys more often than I do. Obviously, we have a lot in common. I enjoy hanging out with these guys. But I do get to hang out with them at multi-artist events, festivals; anything where there's more than one artist on the bill. I open for them, or whatever. that gives me a chance to hang out. That's definitely something that I love and enjoy about the Texas music scene. Feeling that I'm a part of a music scene, you know, I guess I never felt that way in Nashville, for whatever reason.. I don't co-write, and that's sort of like the Nashville handshake, you know, is co-writing. I was on tour a lot as a solo coffee-house act all over the country and so, for whatever reason, I never .. never fell in with a group in Nashville, that I felt like were my people and that I was really a part of, and when I came back down to Texas, it wasn't long before I felt that way about the Texas music scene and the artists that are in it. EPMS: You won a 2005 John Lennon Songwriting Contest for your song, Hurry Home, which became the Maxell $20,000 song of the year for 2005. How fast afterward did things take off for you? Zane Williams: Oh, not fast at all. That was, I guess '06 (Note: the 2005 awards were given out in July of 2006) , and I spent another two or three years in Nashville. After that and nothing much was going on, and so basically we moved back to Texas to just be close to Texas and start a family. My wife is a died-in-the wool Texan and we had always wanted to get back to Texas. When we got back to Texas, I sorta did solo shows locally in the Dallas area for two to three years. I feel like the real music career I have these days really didn't begin until three or four years ago, when I was on a show called Troubadour Texas, and I signed with an independent record label that I'm still with called Be Music (and Entertainment) and really started going after, I guess you could call it, the Texas music scene, releasing singles to Texas radio and so forth. Even then, I was pretty much starting from scratch, and that was basically three years ago. The answer is, it's been a very long journey for me, and those early song contests I won, they were encouraging, they gave me, I guess, positive feedback that I was writing good tunes, and I got some money and some equipment that sort of helped me out financially, to be able to keep going, but they didn't really move my career forward in any substantial way. EPMS: In Nashville, how much did you play? Your focus was songwriting, right? Zane Williams: Well, not exactly. The reason I moved there was to be a country music star, not that I knew, really, anything about that. When I moved to Nashville, I worked a day job for the first year, and then odd jobs here and there, and then I got a hold of a booking agent that specialized in the college market. Then, for the next six years or so, I made a living playing college coffee houses as a solo act all over the country, with my wife traveling with me. We've been to forty-six states together. I did probably five or six hundred of those college shows, all over the country, and then eventually, I felt like that was not leading to anything greater. Beyond that, I wasn't really building a fan base that way. It was just sort of a paycheck, and that's when I eventually decided to maybe focus on song-writing. So, I did take a publishing deal. My first publishing deal, in '06 or '07... Then, I did focus just on writing for the last two years of it that I was in Nashville. But, I wasn't happy doing that. I've always been a performer. I've always loved performing. I wasn't happy just writing songs for other people. I wanted to make records and I wanted to put on a live show, and I just want to write my songs and sing them for people, that's all I ever wanted. Pretty simple. But it wasn't really until we moved back to Texas, that I was able to find that Texas music scene that I was able to plug into... Where people go, expecting live original music, and there are enough radio stations that will play local artists. Where there is enough infrastructure there that I was able to finally plug into a situation where I could make a living putting on my live show with a full band, doing what I do, without actually being on a major label. EPMS: On Wikipedia it still says you're best-known for 'Hurry Home,' which was covered in 2009 by Jason Michael Carroll. Zane Williams: Well, that certainly used to be my biggest claim to fame, I guess. That song, I believe it peaked at number fourteen on Billboard. Zane Williams: Yeah, for him and as a songwriter, that's definitely the highest I've ever had one of my songs go on the Billboard charts. That's the only song of mine in the top forty on the Billboard charts. So I guess that is the biggest feather in my cap, sort of. But these days, as an artist myself, I've played the Grand Old Opry, and I just won the Entertainer of the Year at the Texas Regional Radio Awards, and I don't really play 'Hurry Home' that much in my live shows, so that's a little bit more of my past. That's something that happened to me like nine years ago. I've had a lot of things that have happened since then, but I'm certainly thankful for that song. The royalties from the radio play on that song paid off my house, actually made it possible for us to buy a house. A singer/songwriter, a guy like me, they wouldn't give me a mortgage. I was able to buy the house with the money from that song, so it's definitely a big deal in my life, but not as big of a deal these days just because like right now, Pat Green has a radio single, a song called 'While I Was Away,' I wrote that song. Carrie Underwood just tweeted about it, said it made her cry, and stuff like that. These days I'm probably better known for my own artistry, and songs like 'While I Was Away,' than I am from 'Hurry Home.' I bet a lot of people don't even remember that song, or know that I wrote it. EPMS: I saw a comment of yours about still exploring how to put on a big show. Zane Williams: My heroes, I guess musically, are people like Garth Brooks, and the Dixie Chicks, Alan Jackson. When you go see those people live, there's lights, and there's energy, excitement, everybody singing along, and that's what I've always envisioned for myself. Just have a good crowd, and everybody singing along to the songs, and have it be fun, and have really great musicians with me on stage that were entertaining people, and wowing people with what they could do and just, you know, a concert experience. For so many years, I was just a solo act. Just myself and a guitar... I told a lot of stories, and I sang a lot of songs that were very lyrically based, where it was obviously, just myself and a guitar, and I'm not the world's best guitar player. If it's a solo act, it kind of all depends on the words in the songs. In a full-band concert situation, there's so much more going on. It's the drums, it's the beat and the groove and the sound system, the lights, and everything else that's going on. That's what I've always envisioned doing someday. But I've only been playing with a full band now for three years, and I just turned thirty-eight. A lot of people put their first band together when they're in high school. I never played with a full band until I was in my mid-30s. EPMS: I have noticed on Twitter where you encourage your fans to come eat with you and the band before a show. Does that ever get rowdy? Zane Williams: No, I mean, that's my goal for those things, to like fill up the place and have a good time, but so far, honestly I've done a bad job of letting people know about that beforehand. Sometimes I don't think of doing it until the day of the show, and then I tweet out about noon. I don't think a lot of people get the word in time, but no, it's not rowdy. Mainly we just push a bunch of tables together. Whoever shows up, we sit around the table, kind of family-style, and just have a meal together. We hang out and chat, and I do that because I like the fans. I like being able to say 'Hi' to whoever is in the town that we're in. Zane Williams: Some people, a lot of times, we don't play until eleven at night. Some people work the next day, or can't find a babysitter. They may have a reason they can't come to the show, but they can still come to the dinner and at least say 'Hi,' and get a picture or get an autograph or whatever they want. EPMS: How many times have you played El Paso? Zane Williams: This will be our first time. Once again, I guess, El Paso's kind of at that four-hundred mile radius. El Paso's on the edge of that, and this will be our first time to come there and play. I myself have driven through a few times, but we've never played there before. EPMS: Do you know Cody Jinks? EPMS: The reason I mention that, on a Texas TV show we get out here, Texas Music Scene, I saw him talking about having recorded at Sonic Ranch, a very famous recording studio nearby. Zane Williams: Cody is a good dude. I think we have a show or two coming up with him, at least that I'm aware of. He lives in Fort Worth, so we've hung out there in Fort Worth a few times. EPMS: I saw a quote from you where you said that a lot of times, you listen to songs on Shazam and ask yourself, "Who would ever record a song that bad?" Zane Williams: Lol. Well, you know, we've all got different tastes in music and I'm just noting, I know some music companies look at Shazam as an indication of a song's popularity and I was just thinking to myself one day you know, you don't exactly know why people are shazaming a certain song half the time I'm Shazam'ing it because I think it's a great song and I want to find out who the artist is, and half the time i'm Shazaming it because, ohmigosh, that's horrible! Who put that out? EPMS: Texas Like That debuted at number thirty-one. Was that on national charts? Zane Williams: You know, I don't honestly know. I saw that too, somewhere. Maybe that was Itunes? I know that Itunes has its own charts that are calculated, I don't know if it's daily or weekly. I think it might be daily. Between you and me, you don't have to sell very many albums to get pretty high on the Itunes Country Album chart, because not too many people buy albums any more. Being number thirty-one on that chart sounds like a bigger accomplishment than it really is. EPMS: Well, it still sounds like you're doing pretty well. Zane Williams: Our fan base is definitely growing. I feel like the first record I really made, that I had a record label behind me and people promoting it, and a team behind me was 'Overnight Success,' and then Texas Like That' is my new one, and we've seen growth in sales over where 'Overnight Success' was. So, it finally feels like I'm being heard by people. I'm getting enough radio play out there, that my music is getting a fair shake, and people are reacting well to it, and things are growing. Our fanbase is growing, our crowds are growing. Things are getting better and better. It'll be interesting to see where it goes in the next couple of years. EPMS: Thank you so much for your time. See you in a couple of weeks at State Line Barbecue. Zane Williams: OK. I hope you will, that would be great. Thank you for your time as well.